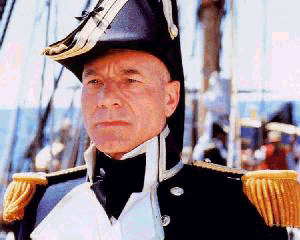 Hi, this site is all about Borg, REAL BORG. This site is awesome. My name is Hugh and I can't stop thinking about the Borg. These guys are cool; and by cool, I mean totally sweet. 1. The Borg are (mostly) mammals. 2. The Borg get cybernetic implants ALL the time. 3. The purpose of the Borg is to not flip out and calmly assimilate other sentient races, adding their biological distinctiveness to themselves. The Borg assimilate anyone they want! The Borg talk to the Collective and don't even think twice about it. These guys are so crazy and awesome that they blow up Federation ships ALL the time. I heard that a Borg was recharging at a recharging station. When some ensign dropped a tricorder, the Borg assimilated the whole planet. My friend Tuvok said that he saw the Borg totally go back in time just because some guy named Cochrane opened a window. Now that's what I call REAL Ultimate Power!!!!!!!!!!!!!!!!!! If you don't believe that the Borg have REAL Ultimate Power you better get a life right now or they will assimilate your mom!!! It's an easy choice, if you ask me. The Borg are sooooooooooo sweet that I want to crap my pants. I can't believe it sometimes, but I feel it inside my heart. These guys are totally awesome and that's a fact. The Borg are tough, uber, cool, strong, powerful, and sweet. I can't wait to join Starfleet next year. I love/fear the Borg with all of my body (including my cyber pee pee). Q: Why is everyone so obsessed about the Borg? 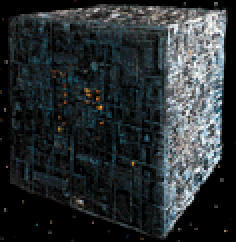 A: The Borg are the ultimate paradox. On the one hand they don't care about individuality, but on the other hand, they're very careful and precise. Q: I heard that the Borg are always cruel or mean. What's their problem? A: Whoever told you that is a total liar. 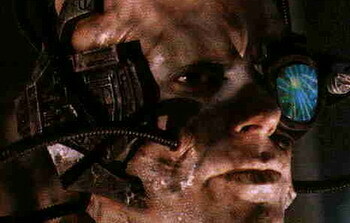 Just like other transhumans, the Borg can be mean OR totally awesome. Q: What do the Borg do when they're not assimilating whole worlds or upgrading their implants? This is a picture of my brother Pat showing off.